This is an index for tropes involving break-ups. A sub-category of Love Tropes and Friendship Tropes. Compare The Ex Index (some tropes are common to both as well). Contrast Reconciliation Tropes. Not to be confused with tropes involving literal breaking. Better as Friends: Two people who have dated for a while realize that they are better as friends. Break His Heart to Save Him: A character breaks up with another for their own safety. Breaking the Fellowship: A posse of people is split up, usually as a way of weakening them. Break-Up Bonfire: After breaking up with someone, a character burns everything that reminds them of that person. Breakup Breakout: A performer achieves success after splitting off from a duo or entourage. Break-Up/Make-Up Scenario: Two characters break up before eventually getting back together. Break-Up Song: A song about ending a relationship. Break Up to Make Up: A character recognises their own self-worth when pining for another character. "Dear John" Letter: A break up in writing. Defenestrate and Berate: After breaking up with someone, a character throws all that person's belongings out a second-floor or higher window. Downtime Downgrade: Two characters who get together in a film have broken up in the sequel. The First Cut Is the Deepest: A character has emotional issues about romance following their first break-up. Heartbreak and Ice Cream: Characters eat ice cream following a break up. Heartbroken Badass: This can be due to a break-up. I Have No Son! : When a parent cuts ties with their child. It's Not You, It's Me: Lack of self-worth causes a character to end a relationship. It's Not You, It's My Enemies: The Hero breaks up with their Love Interest on the grounds that they won't be safe with them. Leaving You to Find Myself: A character breaks up with another as a result of Character Development. Let's Just Be Friends: They break up, but they decide they'll be friends because they still care about each other. Lost Love Montage: A montage which plays after a break-up. Love Cannot Overcome: The Hero's Love Interest breaks up with him because she can't deal with the thrills and dangers of his lifestyle. Make Up or Break Up: A potential break-up situation when a character does something their partner doesn't approve of. The Masquerade Will Kill Your Dating Life: A character's Secret Identity causes issues with their dating life, possibly leading to a break-up. Mess of Woe: An intense breakup causes you to neglect cleaning for several weeks. Minor Flaw, Major Breakup: A character breaks up with their partner over a minor flaw. Mistaken for Cheating: Characters break up due to one of them being falsely accused of cheating. The Mourning After: Refusing to love again due to still being hung up on a former lover. Not Good with Rejection: A character doesn't respond well to a break-up. Offscreen Breakup: They broke up, but it never happened on-screen. 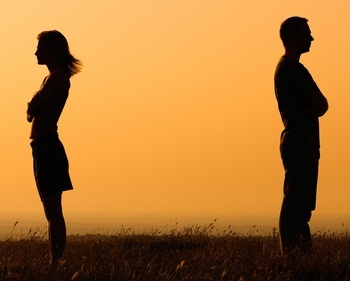 On the Rebound: Entering a relationship very quickly after breaking up. The One That Got Away: A character has bittersweet memories of their ex. Please Dump Me: A character acts obnoxious in order to get their partner to break up with them. Plot-Mandated Friendship Failure: Good friends have a falling out after hitting rock bottom. Psycho Ex-Girlfriend: A break-up caused this character to snap and turn evil. Relationship Revolving Door: A couple keeps breaking up and then getting back together. Relationship Sabotage: If successful, it will lead to a break-up. Replacement Love Interest: A character who has recently broken up starts a relationship with someone who looks/acts suspiciously similar to their ex. Second-Act Breakup: The Official Couple temporarily breaks up in the middle of the story. Spurned into Suicide: Getting dumped causes a character to kill themself. Struggling Single Mother: A financially-dependent mother is left to raise her child/ren alone after breaking up with the father of her child. Toilet Seat Divorce: When a couple breaks up for silly reasons. Why Would Anyone Take Him Back? : A couple that breaks up due to the actions of one partner and then getting back together is seen as being implausible. Your Cheating Heart: Being unfaithful to a partner leads to a break up. We Used to Be Friends: Former friends went their separate ways.